In life, it's the little things that make all the difference, well your wedding day is no different. Every wedding package offers different amenities and options, and one can get lost in the shuffle. 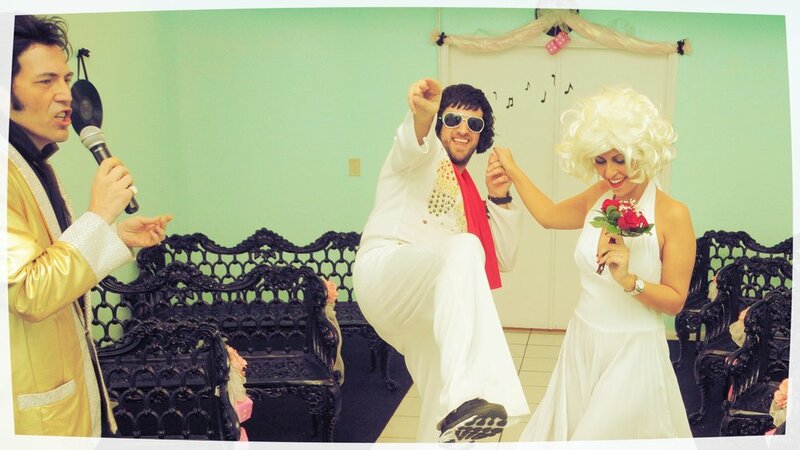 Here at The Elvis Wedding Chapel in Las Vegas, we offer everything from the basics like a champagne toast or a ceremonial unity candle to more elaborate and unique features such as Elvis Shades, Elvis and Marilyn costumes, Pink Cadillac transportation or even an Elvis/Pink Caddy Vegas Strip Photo Shoot. Some of our most requested bridal upgrades include makeup and hair service, cascade bouquet and flower crowns. These not only add value to the bride's experience on her wedding day but also a tremendous prop for the wedding photo shoot. Another add-on with some bling would be the diamond finish, to put a little sparkle on your floral arrangement. No matter where in the world it is that you're from, we want to make sure that all your friends and family back home can watch your ceremony here live in Las Vegas. We offer a live webcam stream in most packages but can be added as an upgrade if yours doesn't include. No wedding or renewal is complete without amazing pictures to show everyone and prove it happened. All ceremonies do come with ceremony photos included, but we make sure to provide a free optional photo shoot before and after your ceremony for a few more opportunities to create some magical memories. We offer these images digitally or printed a la carte or in value bundles for your convenience.